Ever made something super silly, meant for a special person who would understand it and really enjoy it and then feel the need to share it so all can enjoy in the silly ridiculousness of it all? This just recently happened to me. My mother LOVES chickens, she has always had chickens, her kitchen has chicken wall paper on the walls and chicken pitchers on the shelves, her back yard is half chicken coop, and they wander around her yard laying eggs all over the place. Every year for her birthday or Christmas I make her something chicken related..,, well this year for her birthday I was thinking about going silly… super silly. 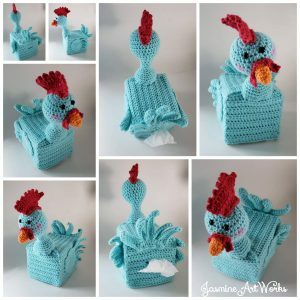 I wanted something functional like her wall paper or a vase that I could make into a chicken…. One of my kids had a head cold and there was a box of tissues sitting in front of me as I was thinking of the possibilities… and then it hit me! You gotta cover the box and make it a chicken! I went on a google search to see what kind of patterns were out there. There really wasn’t anything close to what I was hoping for… (it had to have that silly element) So.. I set out to make one myself! 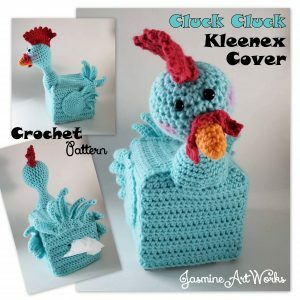 My husband has a great sense of words and when I asked him what it should be called he immediately came up with “Cluck Cluck Kleenex Cover” Hilarious! I’m so thrilled to share chicken joy with you. Happy Crafting!